In 2001, Ralph Wilson Stadium near Buffalo, New York hosted the Drum Corps International World Championships for the third time. The stadium, since renamed New Era Field, had also hosted the World Championships in 1990 and 1995 while still known as Rich Stadium. After the 1999 and 2000 DCI Finals ended in ties, DCI instituted a tie-breaker policy (since retired) for first place in the event there would be another tie at the top. While The Cavaliers won the title free and clear, The Cadets and Blue Devils tied for second place, followed by Santa Clara Vanguard in fourth and then Glassmen, marking the Toledo, Ohio corps’ third fifth-place finish in four years. The 2001 season also saw the DCI Eastern Classic move from Allentown to Philadelphia for the first of two years due to J. Birney Crum Stadium undergoing extensive renovations. 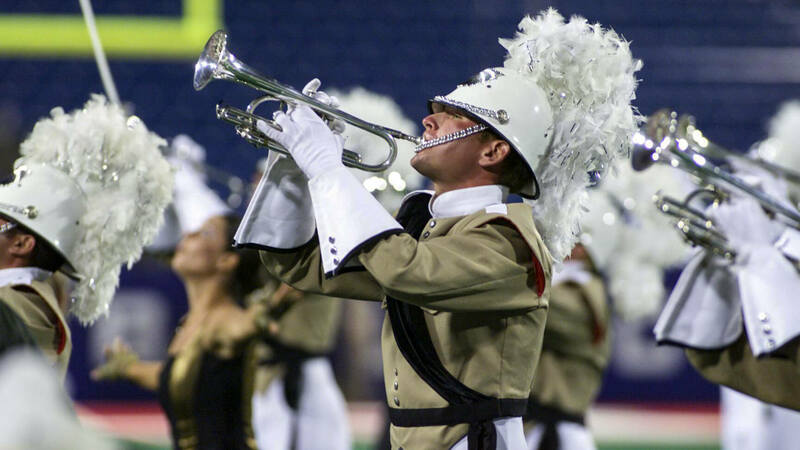 Even after the 2000 rule change allowing corps to utilize any-key brass instruments, Phantom Regiment’s horn line performed the corps’ sixth-place “Virtuoso” production on G-keyed bugles, the only corps in the top-six not yet playing on B-flat horns. The show featured the music of Béla Bartók and Dmitri Shostakovich, two eastern European composers who enjoyed massive success in worldwide concert halls during their lifetimes. Regiment opened the show with “Finale” from Bartók’s 1943 “Concerto for Orchestra,” the movement the composer referred to as having “life-assertion” qualities while dying from an incurable illness in a New York City hospital. A continuous flurry of soprano and mellophone bugle notes—replicating violin runs from the original—never failed to generate a healthy audience reaction. Regal colors of purple and gold in the flags, though muted in hues, seemed to “pop” against the tan of the uniforms worn by the percussion and brass performers. This led into the chorale that introduced the exhilarating climax to the “Finale” movement. Working backward through the Bartók classic, a lone percussionist playing a side drum (double-headed tenor) tapped out the introduction of the second movement of “Concerto for Orchestra,” “Game of Pairs.” The movement is so named for how each of the five sections features a different pair of like orchestral instruments performing the melody in a different melodic interval (minor sixths, minor thirds, minor sevenths, perfect fifths, and major seconds). Only the percussion performed this selection, with a lone piccolo snare (a quite shallow drum) taking over the rhythmic accompaniment until joined by a snare drum. The horns gathered in a single arc to gently play the brass chorale that interrupted Bartók’s original, sans percussion except for an occasional tapping of the side drum. This is the same chorale known to drum corps fans as the opening to the Buddy Rich jazz piece, “March of the Mushroom Hunters,” performed by the Madison Scouts in 1984 and Spirit of Atlanta in 2006. During this segment, the color guard members performed interpretive dance without equipment, playing off the sparseness of the lovely music. A short percussion interlude segued into the opening fanfare of Shostakovich’s “Festive Overture” of 1954, arguably the most jubilant and optimistic work produced by the Soviet nationalistic composer. Shostakovich wrote the work at the request of the director of Moscow’s Bolshoi Theatre, completing it in just three days for an event commemorating the 37th anniversary of the Bolshevik Revolution that spurned the creation of the Soviet Union. The color guard performers, formerly wearing all black, slipped on purple tops the same color as one of the two shades of purple in the new flags. Regiment did very little to water down this fast and perpetually moving blizzard of notes that continuously ran up and down the melodic scale. The continuous offbeats must have been quite a challenge to keep in vertical alignment while moving, so in the middle of the piece, the brass players were given a break from the music. The percussion section took over and the brass then gathered in a giant arc stretching just over 60 yards to perform a series of pantomime dance steps as if toy soldiers. Bright flags of large solid yellow and orange triangles popped up when the horns started playing again, leading to a restatement of the opening fanfare that passed through two company front “fake-outs” dissolving into zigzags before the real company front coalesced and pushed forward. Following this, five different groups of flags introduced within their grouping a different variety of like colors, moving from left-to-right; blues, teal and light green, purples, pinks and reds, and oranges and yellows. Phantom Regiment’s 2001 sixth-place finish became the corps’ highest in four seasons, bettering eighth-place finishes in 1998 and 1999 and a seventh-place finish in 2000. 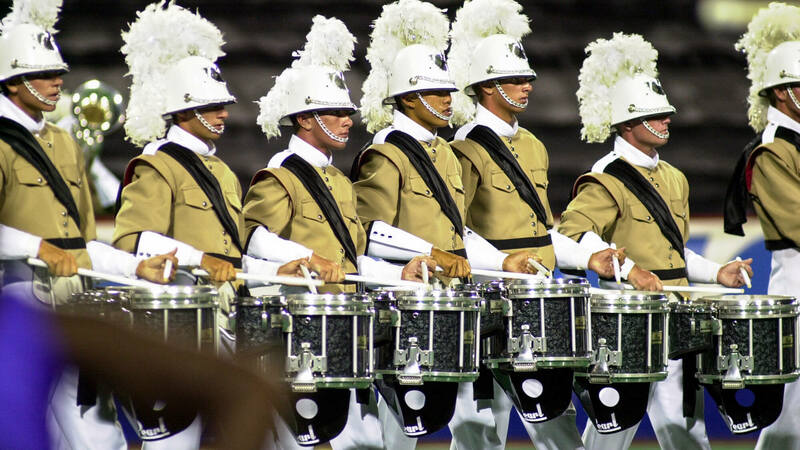 The corps continuously placed higher than sixth the next seven seasons, culminating with winning the DCI World Championship in 2008, the corps’ first title since 1996.